Finding short scary ghost stories to tell around the campfire is a long-standing tradition passed down from one generation to the next. Perhaps these tales about a missing scout leader, a menacing spirit, a ghostly piano player and other ghost stories will send shivers down your spine. The campfire is crackling while the moon is high, and it's the perfect time for a few short and spooky stories to entertain your crew. The key to making these stories especially effective is delivering them as though they are fact, right to the very end. A little drama doesn't hurt either. 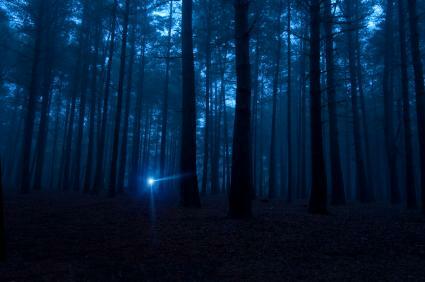 You know, it was on a night just like this when a little girl went missing in these woods. The rangers reveal her name was Cassie, and she had gone camping with her girl scout troop. That first night, when everyone was gathered around the campfire, the little girl ignored what she had been taught about sticking with her camp buddy. She heard a little rustle in the nearby brush and thought she just might catch a bunny to keep as a pet. She quietly snuck off after the sound. It wasn't very long until her camp buddy noticed that the girl was missing, and she told the scout leader about it. The rest of the girls were ushered back to their cabins, and the scout leader and a few of the moms gathered their flashlights and set out to look for the girl. A short time later, a terrible thunderstorm blew in, making it impossible to keep looking for the missing camper. The moms decided it was best to turn back and continue the search after the storm had passed; after all, the little girl wasn't one of their daughters. However, the scout leader refused to give up. With her hair plastered to her face by the rain and the lightning flashing all around, she bravely walked into the woods, calling the little girl's name. The sound of her calling could be heard, over and over, until it faded away. When the moms arrived back at the cabin, they discovered that the little girl had found her way back on her own and, except for a few scratches, was none the worse for wear. The violent storm continued through the night, but all was still again by morning. However, there wasn't sight nor sound of the scout leader. The moms alerted the park rangers and a search party was formed, but not a trace was ever found of the missing leader. The old tombstone was beginning to crumble, but it looked like as good a site as any to set up. Aidan and Mark set the recorder on the ground between them and scanned the darkened cemetery with their flashlights. There wasn't a sign of a caretaker, and they hadn't really expected to see one given the dilapidated state of the graveyard. "Turn it on and let's begin," Aidan said. Mark flipped the recorder switch on, and Aidan began asking questions out loud. "Is there anyone with us tonight?" Nothing filled the silence except a slight scritch-scritch from somewhere behind the stone. Unperturbed, Aidan asked the next question. "Can you tell us your name?" Again, the only sound was a scritch-scritch. "Can you show yourself?" As before, just a scritch-scritch from behind the stone. "Are you afraid of us?" asked Aidan. This time there was no scritch-scritch, but the atmosphere suddenly seemed thick and malevolent. Neither young man noticed the towering dark shadow that rose from behind the tombstone until it was too late. The darkness swooped down and engulfed them until neither one could see the other, and just as suddenly, Aidan, Mark and the black shadow vanished into the ground. 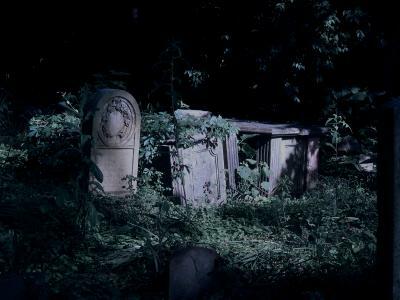 The next morning when the old caretaker showed up, he found the recorder laying on the ground in front of the tombstone. He turned it on, and in the silence that followed each of Aidan's questions, you could now hear the following replies spoken softly by a deep and menacing voice. "My name is never spoken by your kind, but it is very old." "I'll show myself, but it is the last thing you'll ever see..."
The caretaker quietly pocketed the recorder, looking around to assure himself he was truly alone. He took the only evidence that anyone had been near that particular tombstone again, and he tossed it in the pile with the rest in the tool shed. Felice awoke to the sound of Beethoven's Moonlight Sonata wafting its way up from the inn's conservatory. She had just checked in two hours ago, bleary eyed from the four hour drive en route to her next concert in Seattle. All she really wanted to do was get some sleep before she finished the journey in the morning, so who in the world would be playing downstairs at 3:00 a.m.? Finally irritated enough to drag herself out of bed, Felice padded down the master staircase and across the main hall to the doorway of the conservatory. She froze there, her eyes irresistibly anchored on the handsome man at the piano. He didn't seem quite of this era in his vintage tuxedo and slicked back hair. Felice vaguely wondered if he might be an actor who put on shows about the inn's heyday in the roaring twenties. Indeed, there was even a glass of gin on the piano top. Without a sound from Felice, the man looked up as though he had expected to see her there all along. "Hello Felice, I've been waiting for you... for quite some time." Felice was mesmerized by his deep black eyes and felt compelled to move toward the piano. "You and I have a duet to play, Felice. Come sit on the bench beside me." Felice found she couldn't resist the man's command, and she slowly sank onto the bench next to him. A sudden shiver overtook her as she felt a distinct chill in the air. 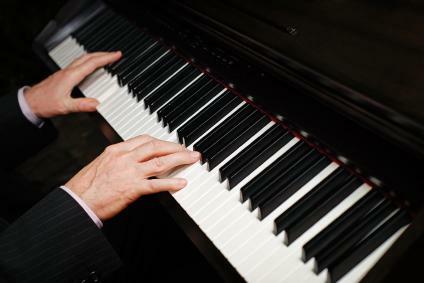 "Put your fingers on the keys, Felice," the man gently coaxed with a predatory gleam in his eyes. As if of their own volition, Felice's hands reached for the keyboard and settled there ready for the next command. "Now play. You know the tune." Felice hesitated, but her hands no longer obeyed her, and they began to play the sonata that had drawn her down the stairs. The man fell into accompaniment and as they played, both figures slowly faded out of site. That was Felice's final performance. Five high school friends decide to camp in the Misty Forest, place in the state park. 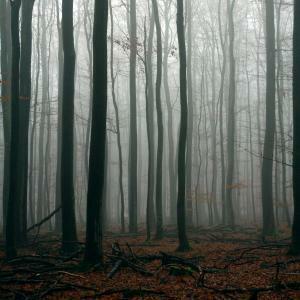 It was rumored a mysterious mist would suddenly appear and anyone caught in it would disappear never to be seen again. The teenagers hiked to the spot, an odd clearing in the forest where nothing would grow. They set up their tents, built a campfire and waited. Around three o'clock in the morning, the campers gave up. Two of the boys slept in tents. The other three settled in sleeping bags around the roaring fire. At sunrise, one of the boys sleeping around the campfire startled awake at the hooting sound of an owl. He was shocked to see a mist moving toward the camp and the two tents. He yelled to his companions, and they cried out for their friends in the tents to wake up. The mist moved into one of the tents and all they heard was their friend's screams of agony. The ghostlike mist emerged from the tent and entered the second tent. Terrified, the boys ran from the campsite, not stopping to look back. When the authorities arrived at the abandoned campsite, they found two empty tents. No sign of the two boys was ever found. They disappeared with the ghostly mist. If you see a creeping mist enter your campsite, run away as fast as you can. The mist might catch up with you, but at least you have some chance of surviving. A couple of hikers got lost in the woods and saw a woman dressed in black along the ridgeline. She appeared to be holding an open book. They surmised she must live nearby and decided to climb the ridge to seek her help in getting out of the forest. They watched her pacing back and forth along the ridge as they continued to climb and climb. She didn't respond when they called out. An hour passed, and they were still climbing. No matter how long they climbed, they couldn't reach her. Finally, they gave up and decided to climb back down the mountain. They began their descent, but the more they climbed downward, the farther away the bottom of the mountain seemed. They were trapped! The hikers panicked and tried to flee. One hiker fell. As he struggled to his feet, he discovered underneath the leaves and limbs lots and lots of skeletons. The hikers screamed in terror, realizing they were just the latest victims of the ghost dressed in black. 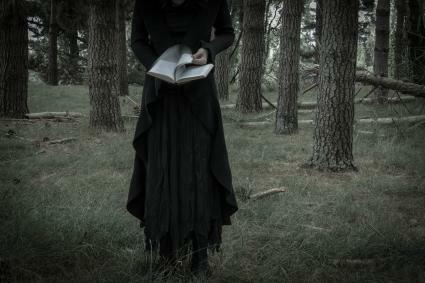 If you see a woman dressed in black and holding a book along a mountaintop, turn around and run for your life or the mountain will entrap you and bind you to the ridge to keep the woman in black imprisoned. A family went camping in an isolated forest with plans to hike to a majestic waterfall the following morning. The youngest, a seven-year-old boy was playing within parents' sight. The mother noticed he was very animated in his solo playing with a small toy truck he'd packed. She went about preparing the evening meal, glancing back at her son now and then as he played, talking and laughing. At dinner time around the campfire, she asked him how he enjoyed playing with the new truck. He said he especially liked the new friend, Jimmy that came with the toy. His mother shrugged it off as pure imagination. That night the family retired in their tent. In the morning, they were panicked - their son was missing. Outside the tent, they found the name Jimmy scratched into the ground and beside it was the toy truck. The little boy was never found. Next time your child talks about an invisible friend, don't chalk it up to imagination. 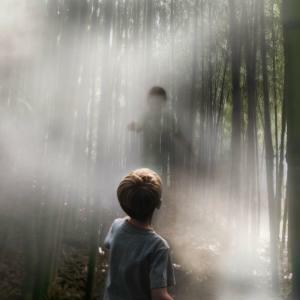 It just might be something disguised as a child ghost. 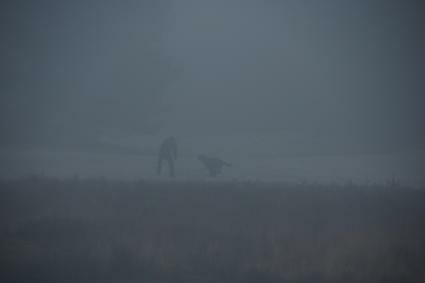 A man liked to walk in the woods with his unleashed dog. One day, the dog returned home, but the man didn't. The search party took the dog with them, hoping it could lead them to the man who must be hurt somewhere in the mountains. One day while searching the forest, one of the search party swore he saw a bear that vanished in front of his eyes. Terrified, the man left the woods and didn't return. That same day, the search party lost sight of the man's dog but soon came across its savagely torn remains and those of the man. When they returned to the man's home to inform his wife, they were shocked to find the dog inside the house with her. When they handed her the dead dog's collar, the dog vanished in front of them. The dog's ghost had faithfully returned home and accompanied the search party until they found the man's body and his faith companion's body. It was concluded that both the man and dog fell victim to a bear even though there had never been any bears reported in the area. Some say it was a ghost bear while others say it was a supernatural creature that killed the man and dog. If you go into the woods beware - there is always a predator waiting. It could be a phantom ghost bear or worse. There are more scary ghost stories to enjoy. Some are original creations desired to give your night a little touch of fright while others are urban legends you may not have heard before. These are scary urban legends that turned out to be true. The scary stories range from a wire stuck in a girl's throat to a corpse discovered inside an abandoned rolled-up rug. These urban legends are really scary with tales of a stalked babysitter home alone to creepy clown statues and Charlie No Face. Urban stories seem to expand with the scare factor heightening with each retelling. Tell a couple of short but scary Halloween stories to kick off the holiday. In one story, a sacred babysitter told to get out by a disembodied voice while another story tells of a girl riding a horse being frightened by a ghost. Three famous yet scary stories about ghosts include the Black Aggie, known as the grieving statue said to be an angel, Harper's Ferry and Jenny, affectionately known as Screaming Jenny and finally the story of the phantom Lincoln funeral train. These spooky tales are written in flash fiction style. These really scary short stories include one about a different kind of possessed doll and a creepy tale of organs being harvested from a woman who is not dead. 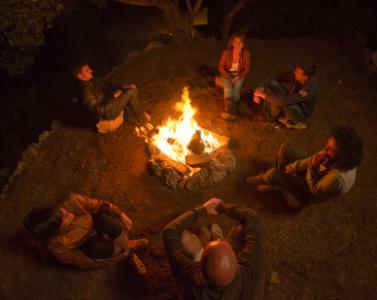 Feel free to share these stories around the campfire with your friends, but wait until younger campers have gone to bed. Otherwise, you might awaken to the sounds of real screams in the middle of the night!